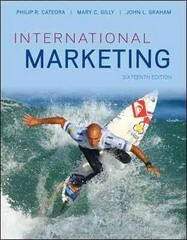 International Marketing 16 Edition International Marketing by Cateora, Gilly, and Graham has been a pioneer in the field of international marketing. The authors continue to set the standard in this edition with new and expanded topics that reflect the swift changes of the competitive global market, as well as increased coverage of technology's impact on the international market arena. Now with over 100 new academic articles and their findings integrated into this 16th edition!Providing a well-rounded perspective of international markets that encompasses history, geography, language, and religion as well as economics, International Marketing helps students to see the cultural and environmental uniqueness of any nation or region. The 16th edition reflects all the important events and innovations to affect global business within recent years, while including several new and updated learning tools and teaching resources.